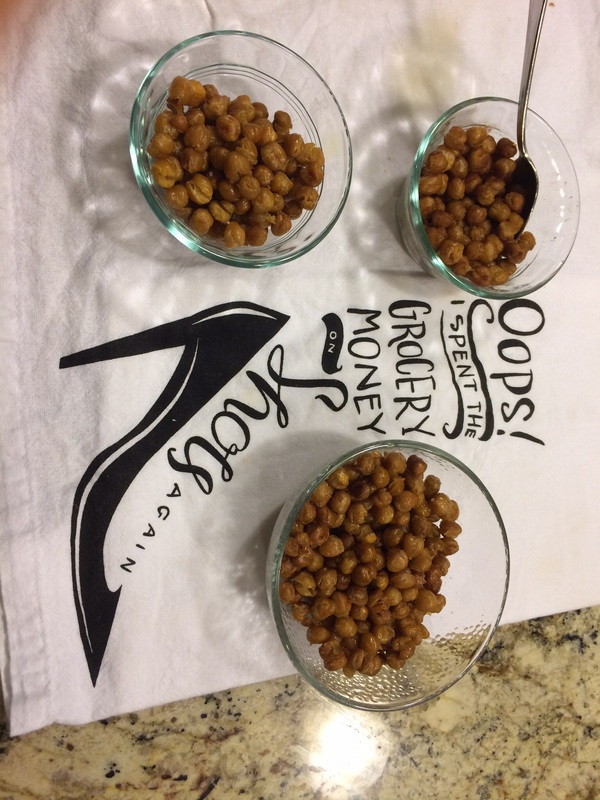 Do you love chick peas? I do and when I love something I try to come up with different ways to make them or incorporate them into recipes. I usually throw chickpeas in my salads and sometimes soups. But did you know that they can be a yummy snack as well? I didn’t…until recently. I stumbled upon some recipes calling for frying them which to me sounded interesting. However, I really didn’t think that would be so healthy so I looked into baking or roasting them and to my surprise they were quite good. Crunchy, sometimes chewy and satisfying! Perfect for a little snack. If you love chips this will be your new go to snack when craving a chip-like snack. They are pretty simple to make and require minimal ingredients using flavors you already have in your cupboard. So let’s get to the recipe! First, preheat your oven to 400 degrees. Then, rinse your chickpeas with water in a strainer. 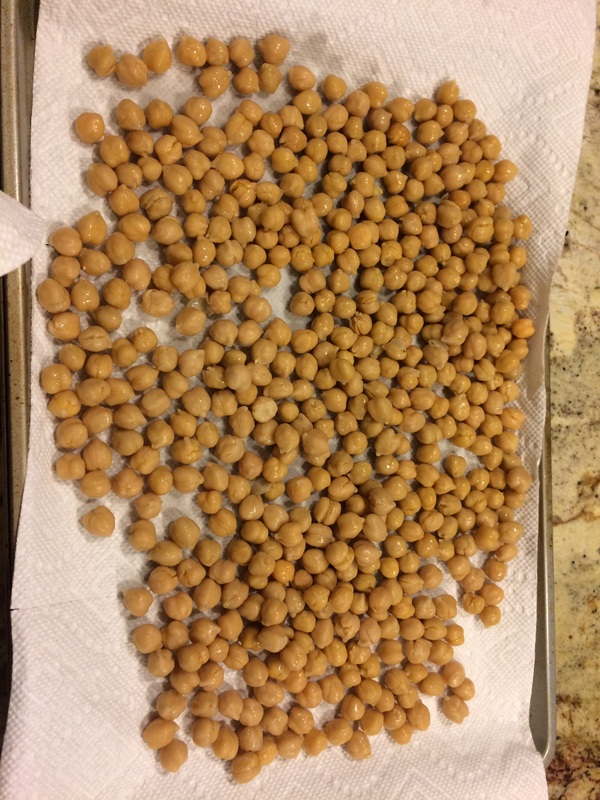 Using paper towels, dry your beans pretty well. 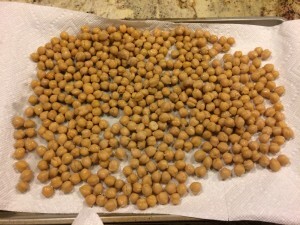 A thin skin may come off some of the chickpeas, just discard those along with the paper towels when done drying. 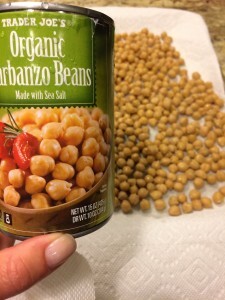 Place the beans in a baking sheets and drizzle with the olive oil. I use my hands to roll the beans around making sure each bean is coated with some olive oil. Roast for about 3-40 minutes until your beans are a deep golden brown and crunchy. Be careful not to burn them so check them often and move around in pan. Now the fun part! I tried 3 different seasonings my first time making them. I separated them into 3 small bowls and seasoned one batch with just salt. The 2nd batch I seasoned with a little garlic powder. The last batch I seasoned with some cinnamon for a more sweet snack. They all were quite good but I was drawn to the garlic batch and the sea salt batch more. Just go easy with the garlic because too much garlic powder can ruin it. Use it sparingly. I will try them again with perhaps some cayenne seasoning. Be creative! I am going to browse the seasoning aisle next time I am at the supermarket and just experiment with these little delights! This entry was posted in Anything Goes!, Healthy Living Recipes!, Snack Attack! 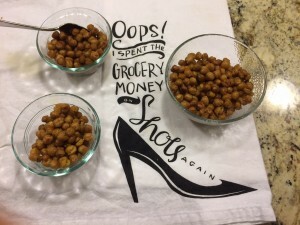 and tagged chickpea recipes, roasted chickpeas.